Every now and then I get to review a tool that seems to do everything right on paper, but falls short just a little bit in the shop. 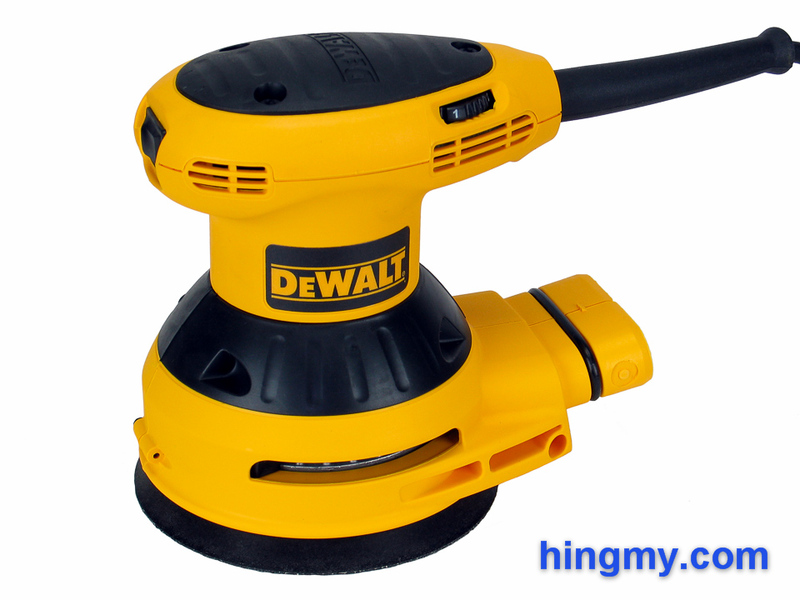 The DeWalt D26453 random orbit sander is such a product. When I first picked it up, it seemed like a sure-fire winner. Durable to the max with good specs it surely would do well? Let's find out what stopped the D26453 from being the pinnacle of random orbit sanders. The first thing you'll notice when you pick up the D26453 is its size. The sander is one of the larger 5" sanders on the market. The handle at the top of the sander dominates the design. It is clearly the place the designers intended the sander to be held. The black rubber patch in the center of the handle is not large enough to cover the entire surface the user's hand grips onto. All this adds up to a comfortable, but not necessarily pleasant grip. The secondary grip around the base of the sander received the same black rubber treatment as the main grip. It is poorly designed leaving the user with no good way to hold onto the sander. The different curves of the tool simply do not follow the shape of a human hand. Sure, the grip can be made to work for a while and it won't hurt you, but you'll be thinking about it while you work. The lower part of the housing flares outward to accommodate the dust port in the rear of the sander. Presumably this design was chosen for esthetic reasons, and to accommodate the oversize dust chute in the body of the sander. In the woodshop all that plastic just above the sanding pad keeps you from seeing what you are doing and makes the sander unnecessarily bulky. Overall the sander is built very well. It has the durability required for use in a professional shop. The motor and metal cooling fan are very heavy for a sander this size, which results in a good amount of downward pressure while sanding. The motor, gears, and controls have all been built for heavy use. The generous 8 ft power cord bends easily and straightens out fairly quickly after being uncoiled. A 4 inch long rubber boot protects the cord where it connects to the sander. This boot keeps the cord up and away from the immediate area around the sander. The power switch in the front of the sander is a little smaller than it ought to be. Covered by a plastic membrane for dust protection the switch is exceedingly difficult to actuate. It does not lock into its resting positions under spring power. Every time the tool is turned On or Off, the user has to remember to push the switch all the way in. If the switch is left somewhere between On and Off, the tool could turn on unexpectedly. After a while you'll get used to the power switch, but this design is far from perfect. A power switch should not require a full paragraph in a tool review. It should do its job so well that the user never ever thinks about it. It's just a power switch after all. The D26453 comes equipped with variable speed motor control. A wheel built into the side of the sander varies the motor's speed from 7,000 to 12,000 rpm in a continuous fashion. The feature works as advertised, but the motor loses a little power in the lower range. Power output is still high enough to provide excellent slow speed sanding performance. Sanding disks are attached to the pad at the bottom of the sander with a hook and loop system. The hooks allow disks to be installed and removed in seconds. In our testing all disks stayed in place without the slightest hint of shifting. The pad at the bottom of the sander showed no signs of wear. Should the hooks wear out, the pad can be removed and replaced. The kit version of the D26453 comes with a cloth style storage bag. With no internal dividers the bag is little more than a generic shopping bag you can buy at the grocery store. It is not water tight, can't be stacked, and barely protects its content from taking damage. Just about the only thing the bag does well is keeping all the parts of the kit in one place. In our opinion you are better off purchasing the non-kit version of the sander. This version still includes the hose adapter and dust bag included in the kit version. After working with the sander in our shop, we have found that the D26453 does everything right, but stops short of perfection in sometimes noticeable ways. Raw sanding performance at high speed places the sander in the lead group for the metric. Equipped with a coarse sanding disc the sander can be used to remove a 1/16" of material here or there, but it won't do it nearly as well as a belt sander. When using disks below 100 grit the sander leaves behind a noticeable pattern of scratches. Finish sanding, on the other hand, is what this sander was made for. It loves to power a 220 grit disk through a project at lightning speeds. A few passes with the D26453 at full-speed is all it takes to prepare store bought 4S lumber or custom milled stock for finishing. 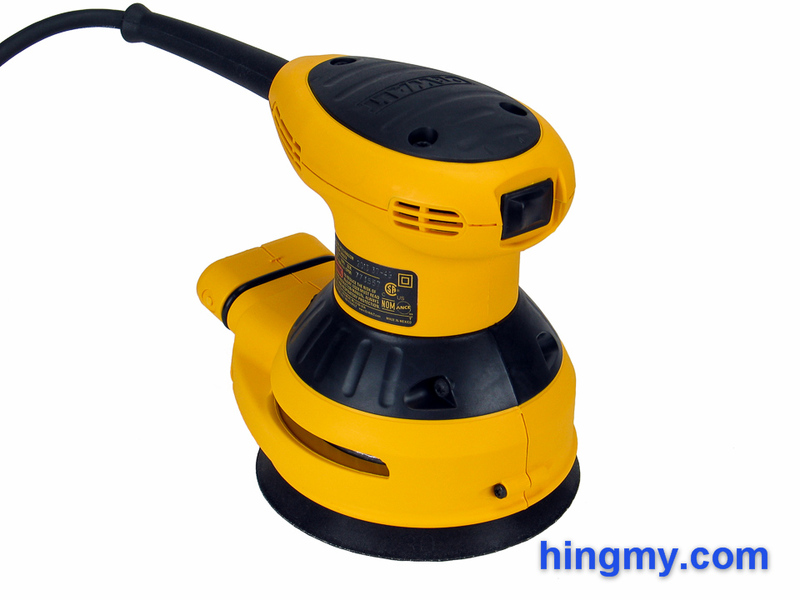 The sander leaves behind no detectable patterns of scratches; neither by the eye nor by feel. The drawbacks manifest themselves mostly in the way the D26453 handles. The sander is a pleasure to use when sanding wide open surfaces like a tabletop. In confined spaces like the inside of a cabinet, you'll quickly notice the bulk of the sander and the sometimes awkward grip. The same issues appear when sanding overhead. The D26453 was well designed for getting into corners. The sanding pad extends beyond the body of the sander on three of the four sides allowing the sander to be placed right up to a wall. The grip is smaller than the base to leave room for the operator's fingers between the grip and the wall. The D26453 produces very little vibration during use. Working for a few hours at a time is not an issue. Working for a whole day will probably leave you with a sore arm at night. The D26453 has its place in a professional woodshop, but it should not be used in an industrial setting. Dust collection using the dust bag included in the kit is poor. The sander's fan generates a good amount of suction that picks up a lot of dust through the holes in the pad, but enough dust escapes to cover the work area in short order. The dust collection bag does speed up cleanup significantly, but it can't be used as a substitute for a shop vac. Connecting the D26453 to a shop vac gives the dust collection mechanism the power it needs to function properly. In this configuration the sander collects almost all dust directly at the source. What little dust escapes quickly settles without creating a dust cloud. A shop cloth is all that's needed for a quick cleanup. The hose adapter at the rear of the sander supports several different hose sizes. The deep socket of the adapter secures the hose very tightly. 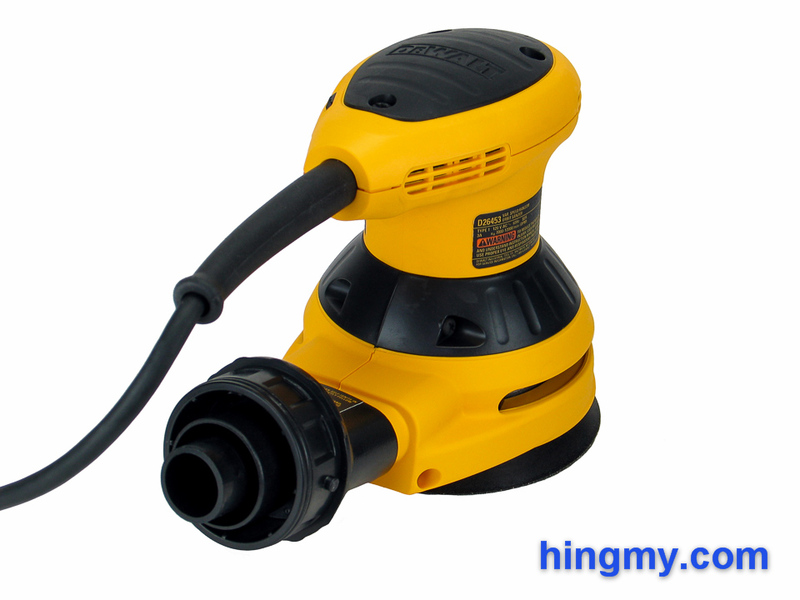 The adapter itself installs on the sander's dust port with a very tight friction fit. During operation the entire setup feels rock solid. The hose and adapter are never in any danger of coming lose. The operator can guide the sander with one hand and the hose will follow. The D26453 we reviewed has since been replaced with the newer D26451. The two models are virtually identical short of a few internal differences. The newer model comes with a choice of two different pads. If you prefer smaller sanders, the D26456 might work for you. It packages the same technology in a smaller, more compact body while increasing the motor output a little. 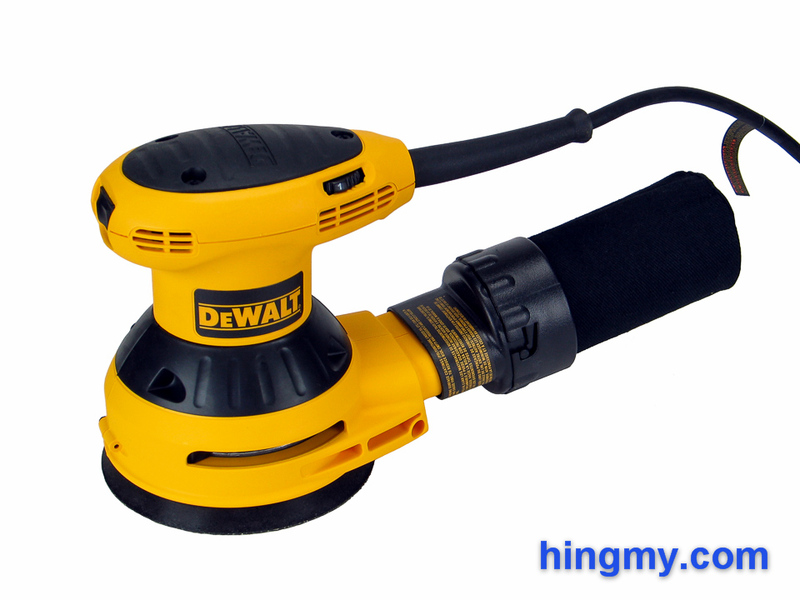 The DeWalt D26453 is a good sander that will perform well for years in a professional and hobbyist environment. It has the power to complete the tasks demanded of such a tool at speed. Equipped with fine grit paper the sander will leave behind a surface void of scratches. The built-in variable speed control is very useful when sanding fine details like veneers or inlays. Dust collection is poor with the dust bag attached, but improves to near perfect levels when the sander is used with a hose and shop vac. The awkward design of the upper and lower grips, slight vibrations under load, and the bulk of the sander conspire to taint what would otherwise be a near perfect sander. Several times during the workday the D26453 will feel like an foreign object in your hands, rather than an extension of your body. All this makes the D26453 a great purchase for just about everyone. It's a tool that can do it all, but it is also an imperfect one. You may not even notice the D26543's flaws until you pick up that one sander that gets it all right a few years down the road.